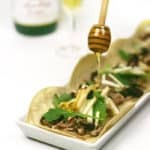 Holiday Apple Cider Pulled Pork Tacos are an easy meal to make at the holidays. Trim excess fat from the meat. Place in a slow cooker. Top with 2 cups Martinelli’s Cider or Apple Juice. Sprinkle with cinnamon, cloves, salt and peppers. Drizzle with remaining 1/2 cup cider/juice. Cook on high for 6 to 8 hours, until pork is cooked and falls off the bone. Transfer to a baking dish. Use two forks to shred pork. Remove any excess fat. Cut apples into matchsticks — to do this, quarter then slice them vertically and horizontally to get long and skinny pieces. Warm tortillas. Fill with pork and top with apple matchsticks, dried cranberries and arugula leaves. Drizzle with honey. Serve immediately.